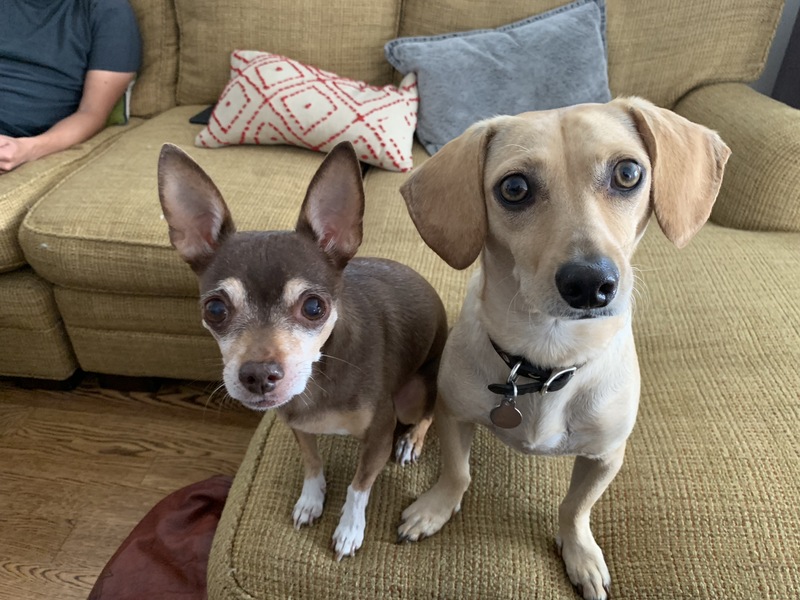 For this Los Angeles dog training session, we shared tips to stop dogs from pulling on the leash to help 2 year-old Dachshund mix Diego (pictured here on the right with his roomie, 13 year-old Chihuahua, Chico) learn to walk with a loose leash. We started off by discussing how rules and structure can help dogs feel less anxious as Chico would sometimes get upset when Diego got over excited or ran about. I recommended the guardians start petting with purpose, reward desired offers when the dogs did them (passive training), how to introduce rules and enforce them and some creative ways to increase the dog’s exercise. Of course one way to exercise a dog is taking it for a walk. But Diego loves to pull on the leash which was frustrating for the guardians and resulted in fewer walks. As a dog behavior expert, my first recommendation in this kind of situation is to do some loose leash training, but to get the dog to walk next to the handler right away, I showed them how to add the special twist of the leash to a martingale collar to stop leash pulling and have more control on walks. It was great seeing how well Diego responded to the tips to stop pulling on the leash. Seeing him walk next to his guardian instead of pulling to be in front put big smile on my face.